● Custer started third, finished second earning nine bonus points. ● The Autodesk Ford driver said the No. 00 Ford Mustang was a bit loose early in the stage. ● Custer started third, finished first earning 10 bonus points. ● The No. 00 Autodesk Ford Mustang pitted on lap 48 for four tires and fuel. ● On lap 80, while attempting to pass Tyler Reddick for the lead, both cars nearly hit the spinning car of Joey Gase. Both cars avoided him and Custer was the leader. ● Custer started 11th, finished first. ● The No. 00 Autodesk Ford Mustang pitted on lap 93 for four tires, fuel and a track bar adjustment. ● Custer pitted on lap 127 for four scuffed tires and fuel. He was penalized for a man over the wall too soon and restarted 23rd. ● On lap 135, Custer pitted for fuel only. Restarted in18th position. ● On the last restart with two laps to go, it was Custer and Tyler Reddick starting one-two. Custer dove below Reddick on the backstretch and they made contact, but the No. 00 car got by Reddick to score the all-important victory. 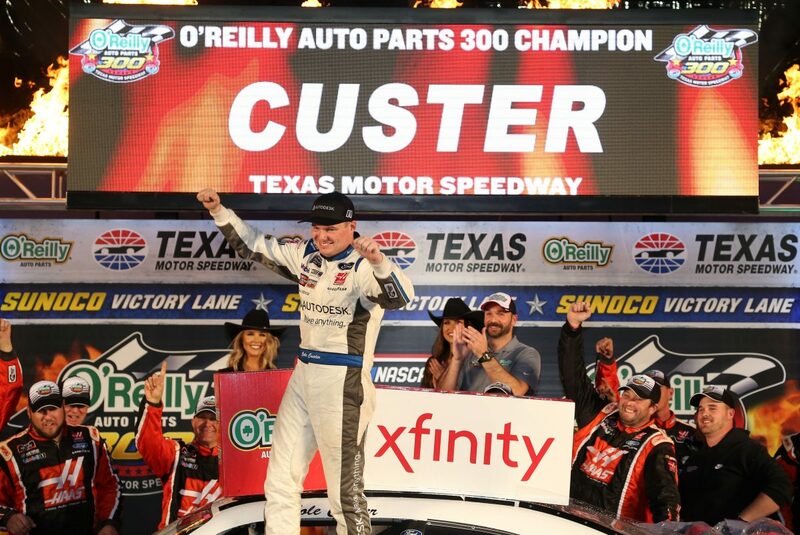 ● Custer won the O’Reilly Auto Parts 300 to score his second career Xfinity Series victory, first of the season and first at Texas. ● With this win, Custer automatically advances to the Championship round at Homestead-Miami Speedway Nov. 17. ● Custer earned 19 bonus points in the O’ Reilly Auto Parts 300. ● There were 13 cautions slowed the race for 54 laps. ● Only 16 of the 39 drivers finished on the lead lap. “I can’t believe it. The 1 (Elliott Sadler) is the best pusher in the series and I hated that I didn’t have him behind me. We did all we could. I drove it in deeper than I have all weekend and it worked out. I am pumped for Autodesk, their first time on the car. Gene Haas, I wouldn’t be here without him and Haas Automation. I am pumped. We are going to Homestead and I think we have a great shot of winning. On the last restart when Tyler Reddick got away, what were you thinking? Did you know you had enough to time to get back to him?